If there’s one thing I love about New Orleanians, it’s that we’re all hams at heart. 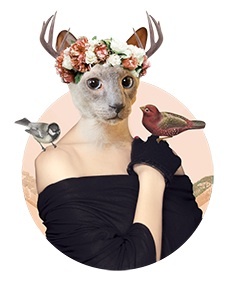 Some of us are less obvious about it, though, until Mardi Gras rolls around. The sixty-something moms and dads who play classic rock covers from a float, for example. Or the insurance salesperson who goes home to practice choreography and sew pompons to her uniform. 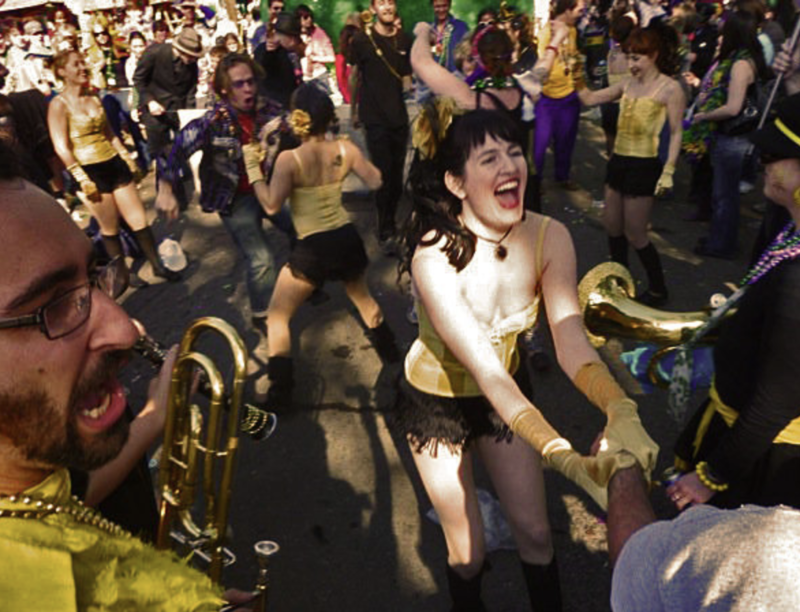 For all the talk of the New Orleans imaginary—and it is a powerful thing—there is in equal parts a New Orleans backed by the purple, green and gold standard of a sweating, drinking, port-olet-finding human being who decided to exhaust themselves by making this thing called Carnival happen. Carnival, done right, is a part-time job, as well as a love letter to ourselves and a million tourists. It reminds us that we’re all having a fleshly experience, and that experience doesn’t last forever. During a parade, you move through the city—passing former neighborhoods, friends, exes, people you’ve lost touch with, people you’ve been. The world watches curbside while you put on a show in the streets. I never tire of it, even when I’m super super tired, physically, like now. That’s why I have been parading for 10 years. Let’s take a look back! 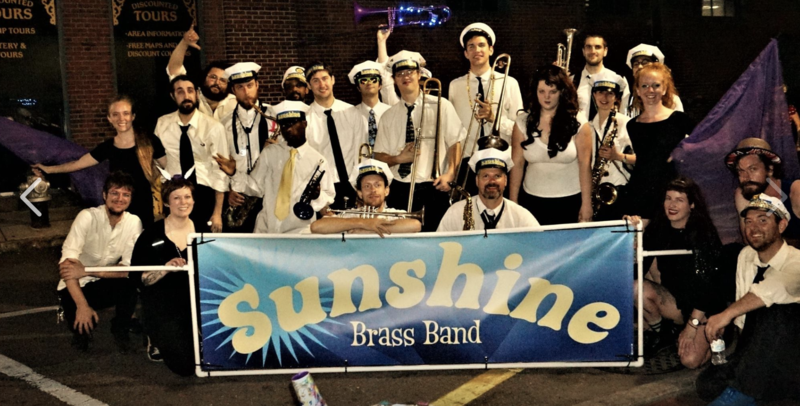 Awesome parade season with Sunshine Brass Band We did Krewe d’Etat and Tucks. I hate Tucks’ signature toilet paper rolls. My flag got tangled up in TP soooo many times, ugh. 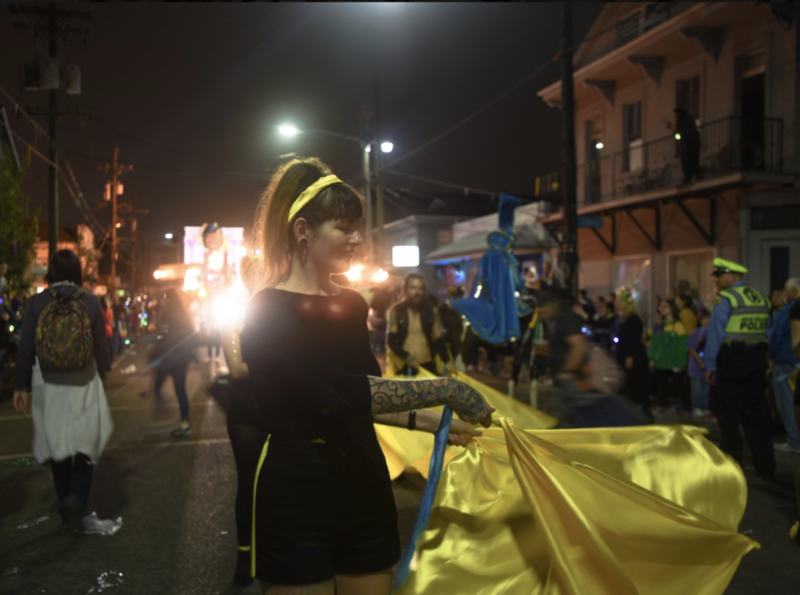 This parade (Krewe d’Etat) was enchanting. I loved being so close to the flambeaux, even if they did spook the horses and make me feel this close to taking a hoof to the head. We marched with Sunshine Brass Band this year, too. This was my first year marching with Sunshine Brass Band. I was a mere banner babe–which is a nice, low-commitment way to participate in a parade. You don’t have to learn choreography or go to rehearsals. You literally just show up to the parade and carry a a banner. See me squatting on the right? 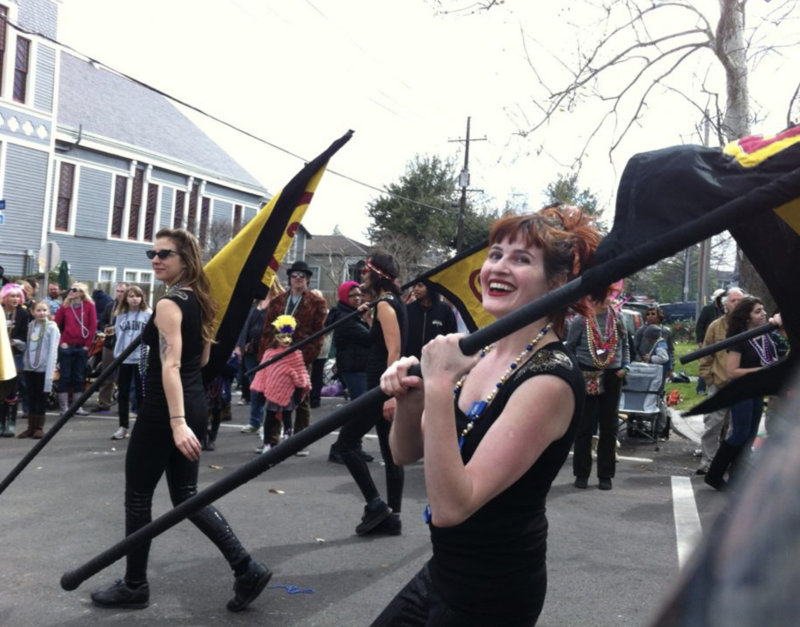 I was on the Gris Gris Strut flag corps, led by the fearless Courtney. Our uniforms were pure fiyah that year. Custom-made gold velvet jackets with sequined epaulets. Hell yes. It’s a shame we only wore them for two seasons before this dance troupe disbanded. That’s me on the far right. The birth of the gold jackets! 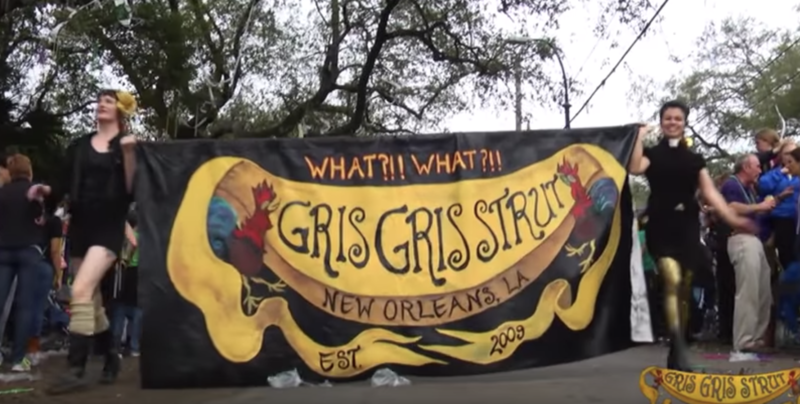 Another year with Gris Gris Strut, and a very cold parade, as I recall. At one point, I wrapped my flag around me for warmth. I’m second from the left. 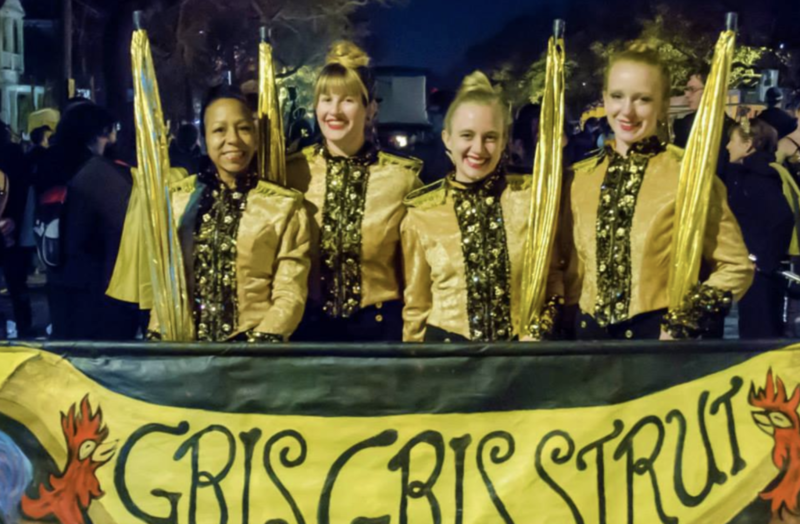 Another Gris Gris Strut flag corps year. These uniforms were the cutest and they were all one piece, which made getting dressed easy (peeing less so). This year it POURED during the day parade. (Thoth? I forget.) I remember taking off my boots and dumping water out of them. This was a year of minimal parading for me–I banner babed one time. I was healing a new thigh tattoo when I did this parade and it was all crusty and tight and nasty. I’m on the left, taking my job very seriously. 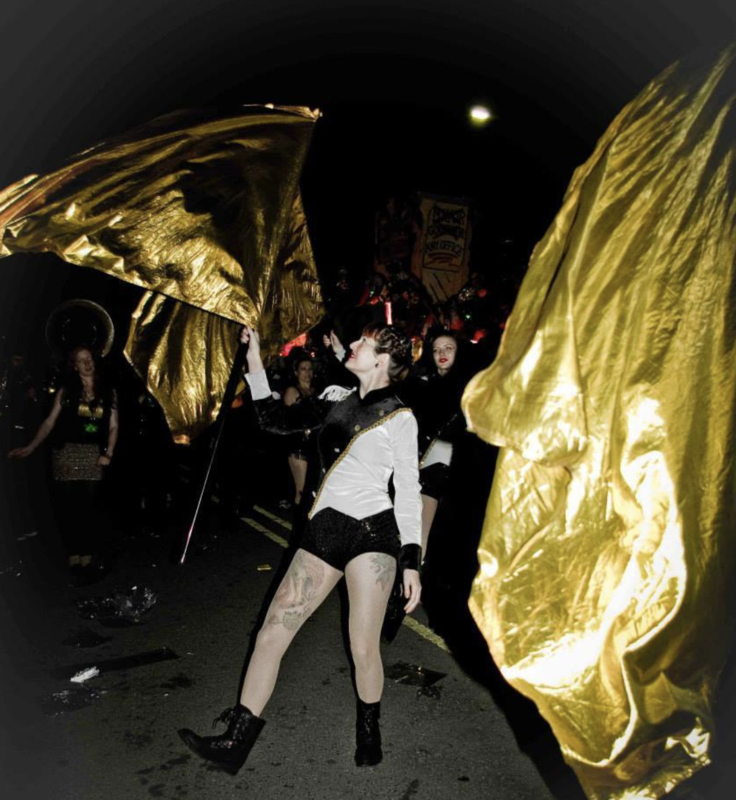 This year, I got demoted from dancing with Gris Gris Strut and placed in a fledgling flag corps. None of us knew what we were doing, but we had fun. Our uniforms were leggings and matching tops from Forever 21, lol. This year, I danced with the 9th Ward Marching Band. It was pretty rad to 1. participate in a Quintron project and 2. march with Proteus, one of the few parading old-line krewes. See me serving face in the middle? 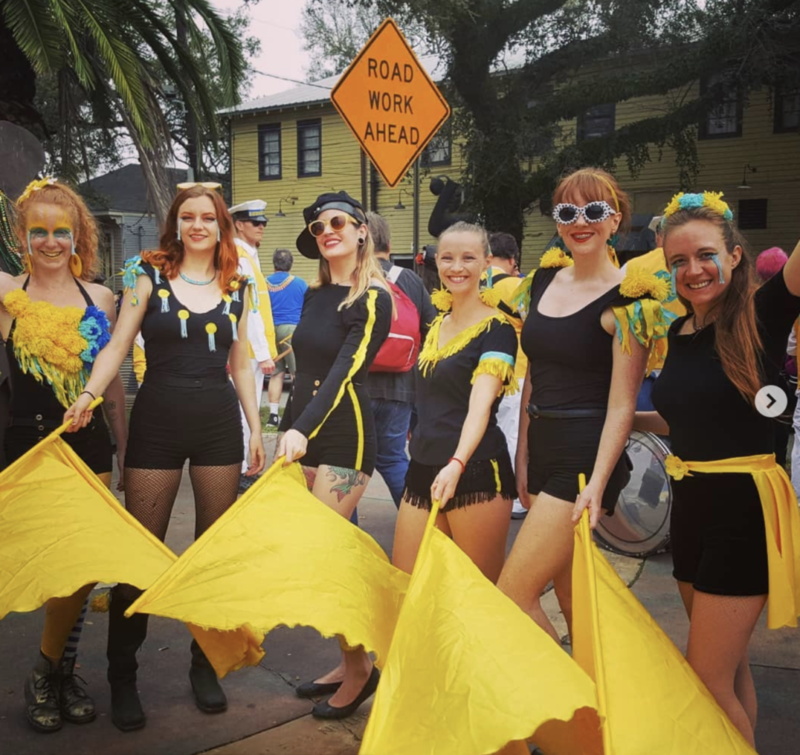 This was my first year dancing in a Mardi Gras parade, and it was Gris Gris Strut’s inaugural season. I sprained my ankle during a rehearsal but marched on it anyway. That’s how bad I wanted to do this parade. I didn’t know then that I had dozens upon dozens of parades to look forward to.